Too bad for me, it belonged to Jeanie, my ship’s computer. A cruel joke, designed mostly for male pilots traveling long distances alone. It was even worse when I ignored the fact she was simply a machine, programmed to think. I sat up from the hard, low-lying bunk, stood and walked toward the front end of my ship. My hope was that Toris would be my gateway to temporary financial security. It was a short distance, nonetheless painful, as metallic floor panels clanked under my feet louder than normal. As I walked onto my bridge, the hyperspeed engines disengaged and slowly wound down. I held onto my captain’s chair to steady myself until we reached a constant velocity. In the second of my four cargo hatches was a cargo container full of blue organic crystals. When I’d picked it up, the seller had instructed me to take it to Toris, the outer planet in the system of the same name. I hadn’t been told why they were needed so quickly, but he’d said I’d double my pay if I made it to Toris ahead of schedule. I didn’t need to be told twice. I took a small taste of the light yellow liquid in the bottle. The Vladirian storekeeper peddling the stuff at my last stop had given me the full story behind the drink. An animal native to Vladiria, a small passive thing called a Roshtu, would secrete the liquid as a defensive measure when attacked. The sweet smell and taste of the liquid would cause the attacking predator to concentrate on lapping up the liquid, intoxicating it and allowing the Roshtu to escape unharmed. I smiled and leaned back in my chair. I usually found scuttled and abandoned cargo, then sold it for profit. Scavenging was a less aggressive form of piracy, and usually safer, since you didn’t have to carry out threats of violence. Unfortunately, such cargo tended to be scarce, and had been more so lately. So, when I’d stumbled into an opportunity to carry cargo, I jumped at the chance. An extra bonus for speedy delivery didn’t hurt matters. A Rulusian freighter in an alien system, all by itself, made no sense. They often stuck together in vast convoys, to give themselves a better defensive position through sheer numbers. Contraband. My smile grew. Rulusians were usually law-abiding as well. I had no idea why one of their ships would be hauling illegal cargo, but with three open bays on my ship and plenty of time to spare, there was only one thing on my mind. “It’s nice you worry about me, but I’ll be fine.” I smirked at the thought of a machine having feelings. I clasped my hands behind my head and sighed. Green Three grew larger in the viewscreen as we approached it. Finding the freighter made me think my luck was turning for the better. Now, the situation was tougher than it first seemed. Soon, I stood inside the airlock compartment of the Rulusian freighter, my Mark II blaster in my right hand. A crude and stubby weapon, it was small enough to hold with just the one hand, with a recoil guard propped against my arm. It had always been there for me, and never let me down. Hopefully I wouldn’t have to put that streak to the test. Green indicator lights above the inner circular hatch told me the pressures had already equalized. I stooped over to the left and looked at my reflection in a dark computer screen mounted in the wall. My face was rugged, covered with a few lines and weathered by experience. My once bright blue eyes were dim from the passage of time. I quickly grew tired of looking at myself and yanked the screen from the wall. It dangled from a large jumble of wires. It was a mystery which ones controlled the locking mechanism, so to save time, I ripped all of them out amidst snapping sparks and rancid fumes. The screen dropped to the floor and smashed. The door popped loose, just enough where I could put my fingers around the edge. The muscles in my arms bulged slightly as I strained. Finally, the door hit a point where it rolled out of the way on its own and I ducked through the entryway. “I’m in,” I announced to Jeanie, out of breath. Inside, I broke into a sweat, both from the physical exertion and the climate controls on-board the freighter. Rulusians were from an extremely warm and humid jungle planet, and liked to make their ships feel like home. My heavy jacket didn’t help matters. Lines of sweat made their way down my face, as I stepped away from the airlock hatch. I turned my gaze down the entry corridor and saw carnage I wouldn’t soon forget. 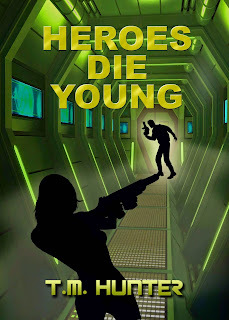 Rulusian bodies were piled on either side of the hallway, burn marks from energy weapons appearing as black patches on their dark green skin. The putrid scent of scorched flesh was in the air. I passed an open doorway on my left, and looked inside at crew quarters. More Rulusian corpses lay amidst sparks and clouds of smoke. I continued down the corridor toward the bridge. Smoke particles lingered in the air and I detected a faint chemical odor while my eyes watered. Dark blast marks lined the doorframe and floor, where an access hatch had been blown open with some sort of bomb. I took slow, cautious steps through the opening and became witness to even more carnage. Ten more Rulusians had collapsed against the outer wall or slumped over consoles, all roasted by weapons fire. I definitely didn’t need to meet up with the people who had done this. I didn’t get into the scavenging business to be a hero. Everyone loves heroes, but heroes have a tendency to die young. I glanced at the console screens while stepping around the short end of an oval-shaped half-wall. All of the displays flickered with minimal power from backup systems, while I stepped over a pair of corpses. I stopped at one and attempted to bypass the lockout. The sweat fell off my face onto the screens and formed little pools which slowly worked up enough courage to slide down the panel. I realized my attempts were useless and walked to a single access hatch at the back of the bridge. A huge smile spanned my face. This was definitely a dream come true. Unfortunately, I only had three bays open and there was no way I was dumping the crystals. Perfect opportunities like these were the exception and after these weapons were sold, I’d likely have to run some more regular cargo. Even in such a huge universe, it wouldn’t take long for word to spread that I couldn’t be trusted to complete a delivery. “Get ready to pull three containers in. The winches should be adequate.” I had a loading arm installed, and even though it was a lot more accurate, it was slow and cumbersome. There was still a bonus on those crystals to keep in mind. The door into the cargo hold slid open easily, which I found odd as I walked inside. The air was stale and dry in my lungs as the floor panels clanged and echoed with each step. The door closed behind me and I glanced down the dimly lit corridor at six bays on either side. The best thing would be for me to drop the first three bays and ignore the possibility of a better catch in the others. A computer console beside the bay door monitored the ambient conditions inside, while a marked service panel underneath drew my attention. I shoved my Mark II into its holster inside my jacket and knelt beside the panel. The cover pried off in no time and I tossed it aside. A lever on the right, and two dimmed lights next to it looked like what I needed. Even though I’d never jettisoned cargo manually from a Rulusian freighter before, there were plenty of bays left to find the proper technique. After I pulled the lever, the lights flashed in an alternating sequence, rapidly increasing in speed before they turned solid. A miniature explosion sounded off as the bay evacuated itself. I moved on to the other bays, going through the same process. As the third bay jettisoned, I heard a metallic clang echo farther down the hold. I pulled out my Mark II and stood, as a woman with bronze skin and black hair jumped out from a crawlspace under the floor. She raised a disintegrator cannon and pointed it at me. I dropped to the floor just before her first shot hit the bridge door behind me and showered sparks down onto the floor grills. I fired a three-shot burst and she dropped down in the crawlspace again, while minimal damage was done to the aft bulkhead. At least it gave me the opportunity to run toward the bridge door, where the impact mark from her first shot still glowed. Eager for cover, I ducked into a small alcove at the front of the hold as another shot struck the wall. Sparks fell at my feet while I pressed my back firm against the cold hard metal. My heart beat faster than it had in quite a while. I yelled out, “You can have the rest. I’ve got all I can carry.” I had no idea how this person evaded Jeanie’s scans, but my main concern now was to get out of this alive. “This is my ship, idiot.” Her footsteps drew closer. “Funny, you don’t look Rulusian.” I eased my head out and quickly jerked back as another shot hit the corner. More sparks showered the grating at my feet. “And get myself shot? No thanks.” The blaster felt loose in my hand, while my palms grew damp. I had no choice. Disintegrator cannons were outlawed for civilian use almost everywhere, and for good reason. “Okay, okay. I’m coming out.” I slid the blaster along the grill and lifted both hands high in the air. “Glad to see some old tricks still work.” She smirked. She scowled and grabbed her weapon a little tighter. “My ship’s computer,” I told her. I looked up, the barrel still pointed at my face. I let the insult slide. “Right now, it doesn’t look like you have a choice. You can stay here and wait for those attack cruisers to show up if you want. Me personally, I plan to be on a ship that can run.” I grabbed my blaster and stood. “Finally,” I muttered as we ran back toward the docking port.